Generic Routing Encapsulation (GRE) is introduced to encapsulate packets. Then these packets can be transmitted over an IPv4 network. GRE provides a mechanism to encapsulate packets of one protocol into packets of another protocol. This allows packets to be transmitted over heterogeneous networks. GRE also provides tunnels to transparently transmit VPN packets. When a device receives a packet that needs to be encapsulated and routed, it adds a GRE header to the packet and encapsulates it into another protocol such as IP. The packet is then forwarded by the IP protocol. 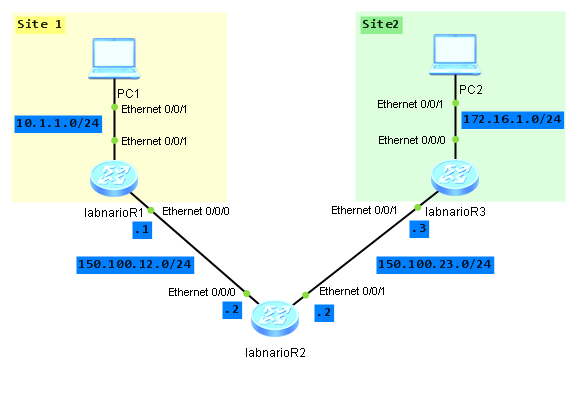 Let’s try to configure GRE tunnel between labnario_1 and labnario_3. All packets sent from PC_1 to PC_2, and vice versa, will be transmitted through the GRE tunnel. Assure communication between routers in the network. It is omitted here. That was to be expected. Poland is out of Euro Cup. The only thing we can do is to come back to the real world :). Today I will show you how to use ACLs and traffic policies for packets’ lost troubleshooting in a network. What we have to do is to check end-to-end connectivity between CE and R2 Loopback100 interface, to find where packets are being lost.